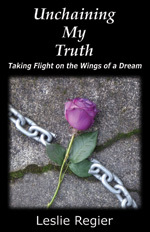 In December 2012 Violet Angel published and released the real-life book, Unchaining My Truth: Taking Flight on the Wings of a Dream, by Leslie Regier. Online sales are available both directly from the publisher and through Amazon.com. The book & purchase details are here.